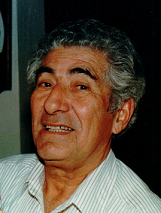 Obituary for Ramon C Isaac | Bagnato Funeral Home, Inc.
From the moment he arrived in Carnegie, he worked 2 jobs working in the early mornings at Beverly Dry Cleaners and working in the afternoons as a shoemaker. He eventually started Ray’s Shoes and Repair and continued working hard into his late seventies. He enjoyed camping at Pymatuning Lake and golfing with family in his later years. Friends received at the Bagnato Funeral Home, Jefferson St, Carnegie Tues 2-4 6-8 PM; Funeral liturgy in St George Orthodox Church, Bridgeville Wed 10 AM; A memorial service will be held Tues 7:30 PM at the funeral home.